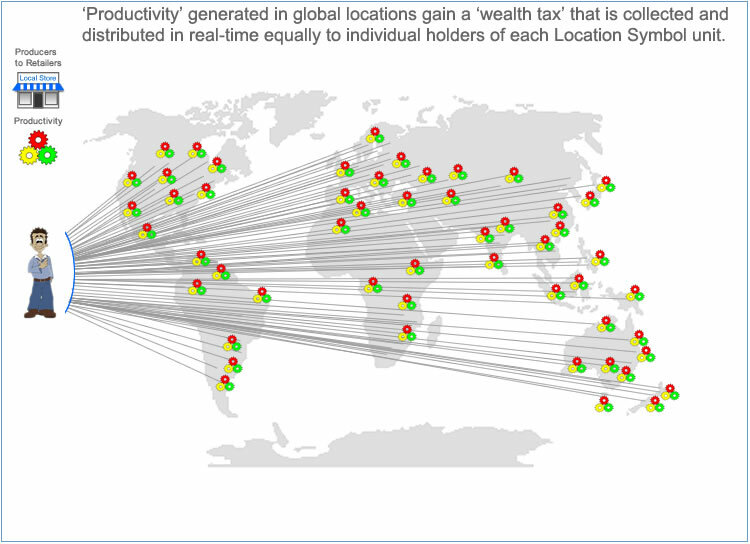 Global flow of the 'wealth' can be distributed fairly and equally! A fair distribution of wealth should be the ultimate goal of all societies. To do that there needs to be flow from the commercial activity through the sellers to the buyers that has a way to spread value and wealth. The Platform is built on the principle of a bottom up economy that always involves the bottom level of the wealth pyramid, it's where the majority of individuals can still benefit from the enormous activity in commerce around the world, regardless of where they are located. The mechanisms of the Platform removes the need for most incumbents, and structure the global economy to have full efficiency in commerce from producers and manufacturers to the end customer and provide all the individuals and businesses with a distribution of global wealth that is free of top end manipulation. It's the combination of several separate mechanisms that allow any individual to have access to the free market, that the Platform provides, by giving a portfolio that can provide an individual to freely get involved with locations around the world that generate productivity. It gives businesses a customer loyalty program that drives incentives continually towards consumers and in turn has a great long-tail that keeps on rewarding both buyers and sellers. The productivity in locations around the world is directly linked with the local fiat currency where products and services are originally manufactured and sold from, it's the amount of connection an individual has with these locations, and the productivity, that their share in the 'distribution of wealth' is made. The distribution is accurate down to 14 decimals, so the most minute size in productivity is able to be recorded and never lost to rounding off of values. Even if a minor number of individuals in a location gained benefit from the distribution, it has a spill over of benefit into the local economy by drawing in wealth from around the world. The distribution process treats everyone equally, it gives everyone equal opportunity to use a free market structure. The process of distribution takes a wealth tax, which is the LAT - a Location Activity Tax, it's debited from each commercial action across the Platform. This LAT, that's not directly deducted to hinder the commerce or any player, is collected in stealth from each location and is shared across all portfolio holders who own an amount of Location Symbol units. - it's the difference in value that the LAT has added on top of the original price for the unit that generates a surplus value, this, when combined with other surpluses from other Location Symbols that a portfolio holder has the freedom to collect, it increases wealth to the individual. This collective value, that continually adds to the surplus value in each portfolio, doesn't increase UDC's unit value but spreads any increased volume across the broader number of individuals holding onto part ownership of the global productivity. - the mechanics of the distribution of LAT has been designed to stop share market mentality where profit takers can take the good from a market ( location ) and move on, it provides true distribution of the fruits of productivity with the quantity of individuals linked to the locations, so the good can be shared in a linear growth. UDC acting as the neutral central currency, per se, is capable of being collected across all commerce activity and distributes 'wealth' in the form of an intrinsically backed currency for an individual to spend into their own local economy or in any location in the world. Because UDC uses the aggregated value of all global fiat currencies as the base value, where it can always be compared and exchanged with each fiat currency, the addition of the distributed UDC to the individual portfolio holder in real time eliminates any manipulation or way of creating credit to distort true values. - it can also give those with the entrepreneurial will, an income from the shared wealth to build businesses that can operate in a free market, adding to the productivity that keeps the ubiquitous distribution of wealth moving.